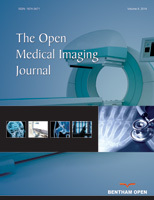 The Open Medical Imaging Journal is an Open Access online journal, which publishes research articles, reviews, case studies, guest-edited thematic issues and short communications/letters on the latest developments and applications of imaging technology in the diagnosis and treatment of diseases of all kinds. It is a mandatory requirement that a signed copyright letter also be submitted along with the manuscript by the author to whom correspondence is to be addressed, delineating the scope of the submitted article declaring the potential competing interests, acknowledging contributions from authors and funding agencies, and certifying that the paper is prepared according to the 'Instructions for Authors'. All inconsistencies in the text and in the reference section, and any typographical errors must be carefully checked and corrected before the submission of the manuscript. The article contains no such material or information that may be unlawful, defamatory, fabricated, plagiarized, or which would, if published, in any way whatsoever, violate the terms and conditions as laid down in the agreement. The authors acknowledge that the publishers have the legal right to take appropriate action against the authors for any such violation of the terms and conditions as laid down in the agreement. Download the Copyright letter. The journal accepts original research articles, review/mini-review articles and letters written in English. Single topic/thematic issues may also be considered for publication. Trial studies should be 1500 to 4000 words with 50 or more references excluding figures, structures, photographs, schemes, tables etc.. This journal publishes open access reviews on recently published books (both print and electronic) relevant to the journal. Publishers and authors of books are invited to contact our book reviews editor at tomij@benthamopen.net with book review requests. All submitted books will be reviewed by an independent expert in the field. No page charges will be levied to authors for the publication of book reviews. The journal also considers Supplements/Thematic issues for publication. The Guest Edited Thematic Issues are published free of charge. The main text should begin on a separate page and should be divided into title page, abstract and the main text. The text may be subdivided further according to the areas to be discussed, which should be followed by the List of Abbreviations (if any), Conflict of Interest, Acknowledgements and Reference sections. For review, the manuscript should be divided into title page, abstract and the main text. The text may be subdivided further according to the areas to be discussed, which should be followed by the Acknowledgements and Reference sections.The Review Article should mention any previous important recent and old reviews in the field and contain a comprehensive discussion starting with the general background of the field. It should then go on to discuss the salient features of recent developments. The authors should avoid presenting material which has already been published in a previous review. The authors are advised to present and discuss their observations in brief. The manuscript style must be uniform throughout the text and 10 pt Times New Roman fonts should be used. The full term for an abbreviation should precede its first appearance in the text unless it is a standard unit of measurement. The reference numbers should be given in square brackets in the text. Italics should be used for Binomial names of organisms (Genus and Species), for emphasis and for unfamiliar words or phrases. Non-assimilated words from Latin or other languages should also be italicized e.g.per se, et al., etc. Moses RG, Luebcke M, Davis WS, et al. Effect of a low-glycemic-index diet during pregnancy on obstetric outcomes. Am J Clin Nutr 2006; 84: 807-12. Stevenson WG, Friedman PL. In: Hennekens CH, Ed. Clinical trials in cardiovascular disease. Philadelphia, WB Saunders Co. 1999; pp. 217-30. Ippolito G, Comandini VU, Nicastri E.The legal proceeding on the use of genotypic assays for the detection of HIV antiretroviral resistance: 2003, National Institute for Infectious Diseases, Rome: Italy. Pagedas AC, inventor; Ancel Surgical R&D Inc., assignee. Flexible endoscopic grasping and cutting device and positioning tool assembly. United States patent US 20020103498. 22 Aug.
All authors must strictly follow the guidelines below for preparing illustrations for publication in The Open Medical Imaging Journal. If the figures are found to be sub-standard, then the manuscripts will be rejected.